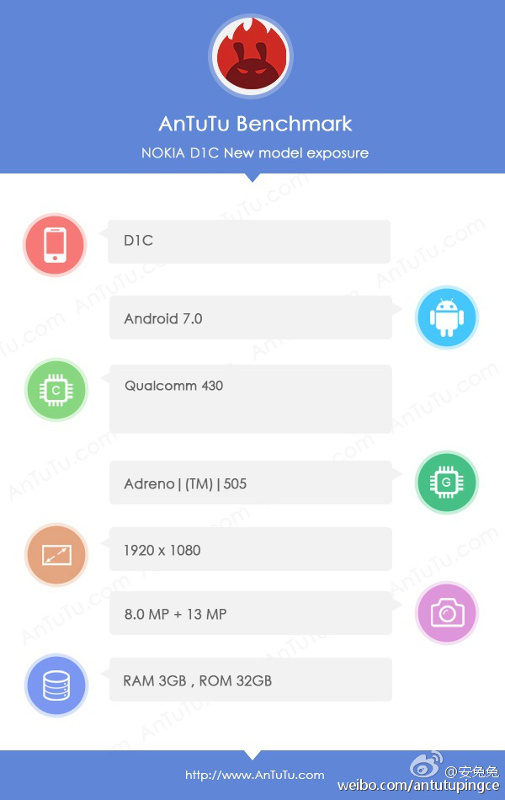 Nokia D1C, the company’s upcoming Android smartphone surfaced on Geekbench revealing few specifications such as Android (7.0 Nougat), Octa-Core Snapdragon 430 processor with Adreno 505 GPU and 3GB of RAM. Now the smartphone has surfaced on AnTuTu revealing more specifications, including details about the camera and display. According to the AnTuTu listing, it will come with a 1080p display, but the size of the display is still a mystery. It will come with a 13-megapixel rear camera and a 8-megapixel front-facing camera. It will likely come with 4G LTE support, but there are no details about the battery capacity. Nokia announced in August that it is coming back to smartphone and tablet market with new Android devices in Q4 216, which is this quarter that ends in a couple of months. According to AnTuTu’s sources the phone will not be released in China. Hope it will come to other Asian markets like India.